Copyright: © 2019 Silva N, et al. This is an open access article distributed under the Creative Commons Attribution License, which permits unrestricted use, distribution, and reproduction in any medium, provided the original work is properly cited. Anti-glomerular basement membrane (anti-GBM) disease is an uncommon autoimmune disease that classically presents as an aggressive necrotizing and crescentic glomerulonephritis (CG), with or without pulmonary hemorrhage, and typically does not relapse. The pathologic hallmark is linear staining of GBM for Immunoglobulin G (IgG) which binds to the alpha-3 chain of type IV collagen. Recent reports have noted the occurrence of anti-GBM disease with atypical clinical presentations. We describe a case of a 22-year-old female presenting an anti-GBM disease with typical histological features with a singular clinical presentation with lower limb edema, elevated serum creatinine and nephrotic range proteinuria. Renal biopsy showed signs of chronicity and direct immunofluorescence microscopy demonstrated diffuse, intense linear positivity for IgG. All serologic tests were negative, including anti-GBM antibodies. Hence, a diagnosis of atypical anti-GBM disease was made. The patient was treated initially with mycophenolate mofetil and corticosteroids. After 3 months she began to aggravate renal function so mycophenolate of mofetil was discontinued and a low dose cyclophosphamide was initiated. Anti-glomerular basement membrane (GBM) disease is an uncommon autoimmune disease which usually follows a self-limited course . It has been known that the predominant pathogenic autoantibody is the IgG isotype and is directed against to the non-collagenous domain of alpha-3 chain of type IV collagen [2,3]. The pathogenic hallmark is the diffuse linear staining of the GBM for IgG on immunofluorescence (IF) microscopy. These antibodies are detected in 90% of patients using conventional enzyme-linked immunosorbent assays . Typically, the disease begins abruptly, often with a ‘viral-like prodrome’, and severe and potentially reversible renal injury, with or without pulmonary hemorrhage . With treatment, it normally subsides, leaving behind a variable degree of lasting glomerular disease, depending on the magnitude of the initial injury and the type of treatment received. Generally, the antibodies anti-GBM disappear from circulation and there is low probability of relapse or recurrence [5,6]. Atypical ‘cases’ have been published in recent years and the majority describes less severe renal involvement and without detectable antibodies anti-GBM in circulation. The present case describes an anti-GBM disease with typical pathologic patterns, however, with a very unique presentation. A 22-year-old caucasian woman with a history of smoking (2-3 cigarettes a day), excessive consumption of anti- inflammatory drugs and recurrent urinary tract infection during infancy was referred to our hospital with asthenia and edema of the lower limbs. She denied fever, weight loss, hemoptysis, abdominal pain, arthralgia, hematuria or other clinical manifestations. On physical examination, the patient was alert and conscious, well hydrated, and not in repiratory distress. Her vital signs were stable. The remainder of her examination was unremarkable. Laboratory analysis revealed the following values: hemoglobin 8.8 g/dL, creatinine 2.4 mg/dL, urea 72 mg/dL, albumin 3.1 g/dL, microhaematuria and proteinuria 4.5 g/24h. Serum protein electrophoresis showed no monoclonal spike, and her serum free light chain, immunoglobulin and complement levels were normal. Serum electrolytes were also normal. Prothrombin time, partial thromboplastin time, and international normalized ratio showed no alterations. Her serum lipid profile and liver function test were normal. Serological tests for viral hepatitis B and C, HIV type 1 and 2, antinuclear antibody, anti- ds DNA, and cytoplasmatic and perinuclear anti-neutrophil cytoplasmatic antibodies (c-ANCA and p-ANCA) were all negative. Direct enzyme linked immunoassay for circulating anti-GMB was also negative. Chest x-ray and renal and abdominal echography showed no alterations. Endoscopy study and computed tomography (TC) scan of the chest and abdomen revealed no abnormalities. Subsequently, a renal biopsy was performed. Light microscopy identified 13 glomeruli (3 cellular crescents, 6 cellulofibrous crescents and 4 with glomerular sclerosis), with 10% of interstitial fibrosis and acute tubular necrosis (Figure 1). 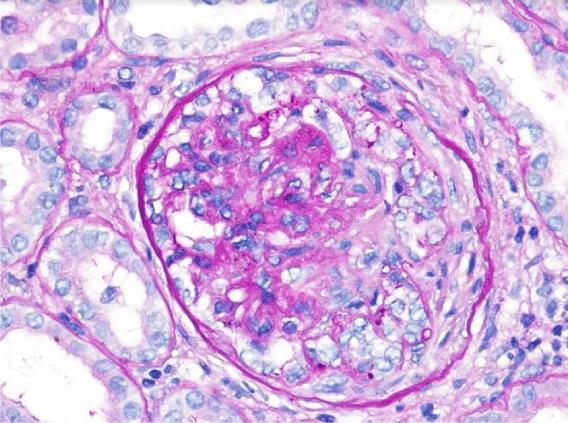 Fibrinoid necrosis was identified in one of the glomeruli (Figure 2). Immunofluorescence microscopy revealed bright diffuse linear 2+ staining of the glomerular basement membrane with IgG1. There was no detectable staining for IgA, IgM, C1, lambda or kappa light chain. Electron microscopy revealed thickening of the glomerular capillary loops, collapse of the glomerular tuff and focal foot process effacement (Figure 3). There were not seen immune or fibrillar deposits. Figure 2: Light microscopy (Periodic Acid Schiff) shows Glomerulus with fibrinoid necrosis. 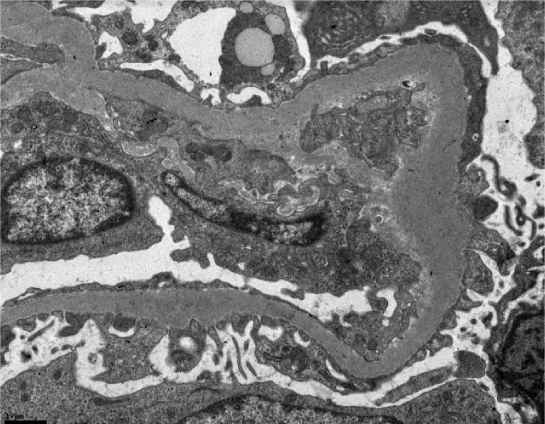 Figure 3: Electron microscopy shows thickening of the glomerular capillary foot process effacement. Serological tests were tested again with ELISA assay and an additional Western blot test for anti-GBM antibodies, which were both negative. Based on the aforementioned findings, the diagnosis of atypical anti-GBM disease was made. Despite being offered treatment with cyclophosphamide, she was treated with 1000 mg/d i.v. methylprednisolone for 3 days, followed by oral prednisolone 1mg/Kg/d and oral mycophenolate mofetil 500 mg two times a day escalated to a maximum of 750 mg two times a day. The dose of mycophenolate mofetil was not increased due to mild hepatotoxicity. Therapeutic plasma exchange was initiated based on the histologic findings. However, it was discontinued after confirmation of negative anti-GBM antibodies (in total the patient had one session of plasmapheresis). Initially, there was a stabilization of the creatinine values and a decrease of proteinuria. Though, after 3 months she began to aggravate renal function (Creatinine 4,7 mg/dL). A second kidney biopsy was performed. Light microscopy identified 20 glomeruli, more than 50% of them with cellulofibrous crescents and 7 with global glomerular sclerosis. There was also 30% interstitial fibrosis. 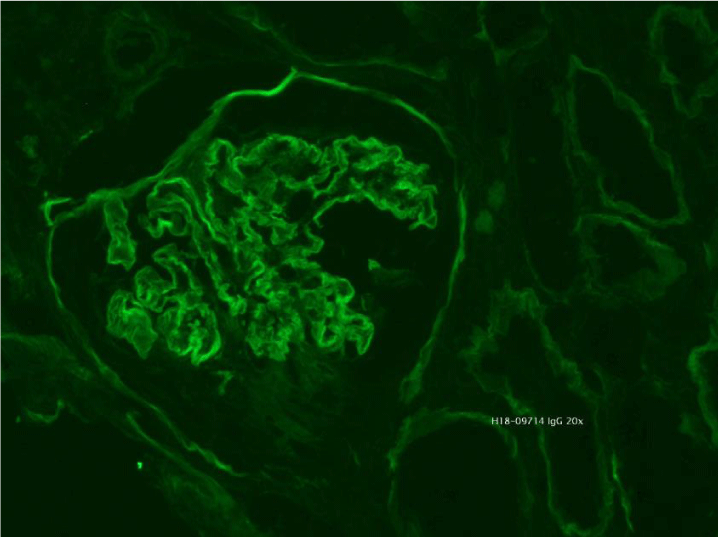 Immunofluorescence microscopy revealed bright diffuse linear 2+ staining of the glomerular basement membrane with IgG. There were detected small deposits of C1q and C3. Mycophenolate of mofetil was discontinued and started a low dose cyclophosphamide (1,8 mg/kg/d). At the eleventh day, the patient developed severe neutropenia (700/μL). Cyclophosphamide was suspended immediately. In view of the extensive chronic damage on the biopsy sample, it was decided not to reinitiate additional immunosuppressive therapy. The patient attended a predialysis education program and chose peritoneal dialysis. Tenckhoff catheter was placed and the patient was discharged 2 days later in good clinical condition but with advanced renal disease (Creatinine 6,9 mg/dL; proteinuria 5g/24h). After 1 month of follow-up she started dialysis (Figure 4). Figure 4: Immunofluorescence microscopy revealed bright diffuse linear staining of the glomerular basement membrane with IgG1. Anti-GBM antibody disease is a rare organ-specific autoimmune disease, which almost always present as a rapidly progressive glomerulonephritis: acute kidney failure with hypertension, glomerular haematuria and non-nephrotic proteinuria. Pulmonary involvement generally affects approximately 40 to 60% of this patients and causes symptoms and signs as coughing, shortness of breath, hemoptysis, chest pain and hypoxia. Up to half of affected patients have renal involvement alone and a small minority (~5%) has pulmonary limited disease. The estimated incidence varies between 0.5 and 1.0 cases per million per year . The incidence spikes around 20 and 60-70 years of age . However, younger patients (< 30 years) are more likely to present with full constellation of Goodpasture’s syndrome, and older patients (< 50 years) with isolated glomerunephritis [6,9] No ethnic predisposition has been identified . Our patient presented with mild renal failure and nephrotic proteinuria. Serum anti-GMB antibodies were not detected using standard contemporary assays. The two kidney biopsies confirmed the presence of bright diffuse linear 2+ staining of the glomerular basement membrane with IgG1, a histologic finding characteristic of anti-GBM antibodies disease. This raises the possibility of antibodies reactive with non-conventional GBM epitopes, of non-typical immunoglobulin subclass, of low affinity or low concentration [11-14]. In this case, before establishing this diagnosis we considered the full differential diagnosis of quasi-linear IgG staining, including fibrillary glomerulonephritis, membranous nephropathy and monoclonal immunoglobulin deposition disease. According to Nasr et al., atypical anti-GBM has better prognosis than the typical disease. In his cohort of 20 patients with atypical anti-GBM disease, the one year survival rate for renal and patient survival was 85% and 93%, respectively. Better prognosis can be explained by the lack of pulmonary involvement and low anti-GBM titer, which results in mild renal involvement and less aggressive GN with a smaller number of crescents . It is widely known that the combination therapy of plasmapheresis, corticosteroids and cyclophosphamide has an overall beneficial effect on both patient and renal survival. Though, the standard treatment has shown to be less effective in some of the more aggressive atypical anti-GBM disease cases [16,17]. This case illustrates a rare variant of anti-GBM disease characterized by an indolent presentation, no pulmonary involvement and undetectable anti-GBM antibodies. We emphasize the lack of correlation between clinical and histologic data. Further research is needed to characterize the molecular structure of GBM in these patients and to establish a more universally acceptable therapy for atypical cases. Cui Z, Turner N, Zhao MH. 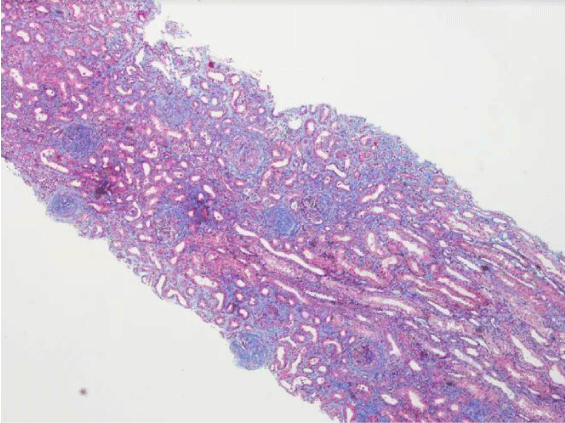 Antiglomerular basement membrane disease: clinical features and diagnosis. 4th edn. Oxford: Oxford University Press, Oxford Textbook of Clinical Nephrology. 2016; 599–605.